Crop failures, saltwater intrusion and flooding are a few of the factors threatening a looming migrant crisis in the Vietnamese Mekong Delta, say researchers. 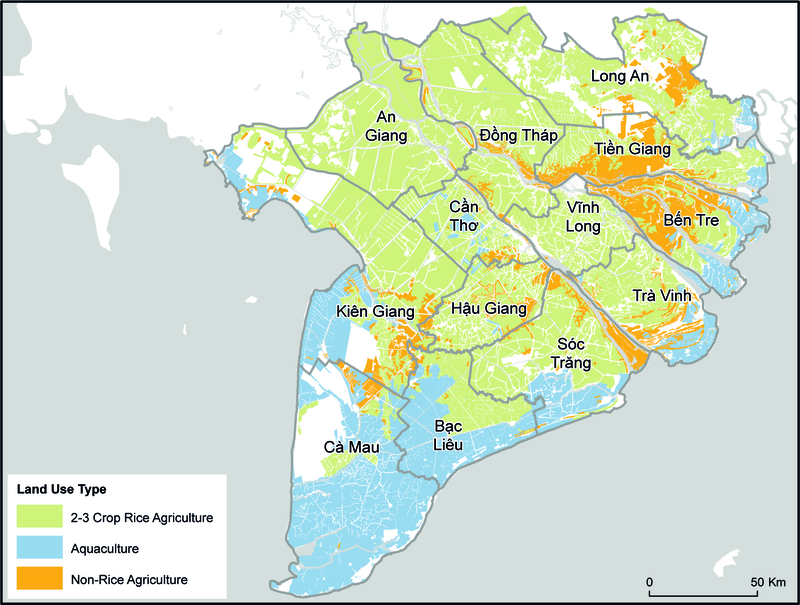 The Vietnamese Mekong Delta is one of Earth’s most agriculturally productive regions and is of global importance for its exports of rice, shrimp, and fruit. The 18m inhabitants of this low-lying river delta are also some of the world’s most vulnerable to climate change. Over the last ten years around 1.7m people have migrated out of its vast expanse of fields, rivers and canals while only 700,000 have arrived. But the high net rate of migration away from Mekong Delta provinces is more than double the national average, and even higher in its most climate-vulnerable areas. This implies that there is something else – probably climate-related – going on here. In 2013 we visited An Thạnh Đông commune in Sóc Trăng Province aiming to collect survey data on agricultural yields. We soon realised that virtually no farmers of An Thạnh Đông had any yields to report. The commune had lost its entire sugarcane crop after unexpectedly high levels of salt water seeped into the soil and killed the plants. Those without a safety net were living in poverty. Over the following weeks hundreds of smallholders, many of whom had farmed the delta for generations, would tell us that things were changing and their livelihoods would soon be untenable. One relatively low profile article by Vietnamese academics may be a vital piece of the puzzle. The study, by Oanh Le Thi Kim and Truong Le Minh of Van Lang University, suggests that climate change is the dominant factor in the decisions of 14.5 per cent of migrants leaving the Mekong Delta. If this figure is correct, climate change is forcing 24,000 people to leave the region every year. And it’s worth pointing out the largest factor in individual decisions to leave the Delta was found to be the desire to escape poverty. As climate change has a growing and complex relationship with poverty, 14.5 per cent may even be an underestimate. There are a host of climate-linked drivers behind migration in the Delta. Some homes have quite literally fallen into the sea as the coast has eroded in the Southwestern portion of the delta – in some places 100m of coastal belt has been lost in a year. Hundreds of thousands of households are affected by the intrusion of salt water as the sea rises and only some are able to switch their livelihoods to salt-water tolerant commodities. Others have been affected by the increased incidence of drought, a trend which can be attributed in part to climate change, but also to upstream dam construction. Governments and communities in developing countries around the world have already begun taking action to manage climate change impacts through adaptation. Our recent research in Vietnam flags a warning about how this is being done. We show that a further group of people are being forced to migrate from the Mekong due to decisions originally taken to protect them from the climate. Thousands of kilometres of dykes, many over four metres high, now criss-cross the delta. They were built principally to protect people and crops from flooding, but those same dykes have fundamentally altered the ecosystem. The poor and the landless can no longer find fish to eat and sell, and the dykes prevent free nutrients being carried onto paddies by the flood. To date, traditional approaches to achieving economic growth have not served the most vulnerable in the same way they have served those living in relative wealth. This was demonstrated most dramatically by the revelation that the number of undernourished people on earth rose by 38m last year – a shift for which climate change is partly responsible. This took place despite global GDP growth of 2.4 per cent. Alex Chapman is research fellow in human geography, University of Southampton and Van Pham Dang Tri is head of the department of water resources, Can Tho University. This article was originally published on The Conversation.